注: Comes complete with 3.6V lithium battery. 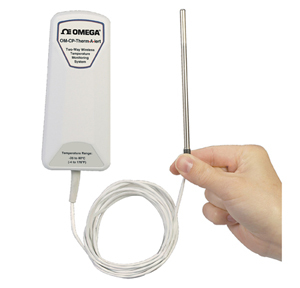 Operator’s manual, Windows software and USB interface cable are included with the OM-CP-RFC1000-EXT wireless transceiver package (required to operate the data logger, sold separately). Note: Because of transmission frequency regulations, OM-CP-THERMALERT-P and OM-CP-THERMALERT-GB wireless data loggers are only approved for use in the following countries: Australia, Austria, Belgium, Bulgaria, Canada, Chile, Columbia, Croatia, Cyprus, Czech Republic, Denmark, Ecuador, Estonia, Finland, France, Germany, Greece, Honduras, Hungary, Iceland, Ireland, Israel, Latvia, Liechtenstein, Lithuania, Luxembourg, Malta, Mexico, New Zealand, Norway, Peru, Poland, Portugal, Romania, Saudi Arabia, Singapore, Slovakia, Slovenia, South Africa, Spain, Sweden, Switzerland, Thailand, The Netherlands, Turkey, United Kingdom, United States, Venezuela, Vietnam.